The OPUS is a measure of listening (auditory) comprehension that evaluates a person's ability to listen to passages that are read aloud and recall information about them. This ability is key to success in the classroom, as well as in social and occupational settings. The OPUS also measures memory skills, which are integral to listening comprehension. The OPUS consists of 17 passages, each with 7 to 10 associated questions. These passages are divided into six item sets (based on the examinee's age and ability) to allow for a brief administration time of just 10 to 20 minutes. Each item set has 5 passages and up to 44 items. The OPUS can be used by speech-language pathologists and other professionals in a variety of settings, including schools, clinics, hospitals, private practices, and intervention programs. 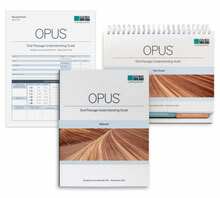 When you need to evaluate response to intervention (RtI), you can use the OPUS to track improvement over time. It can also help you answer a variety of referral questions. For example: Can a student sufficiently understand and retain information heard in class? Are listening difficulties contributing to a child's social skill challenges? 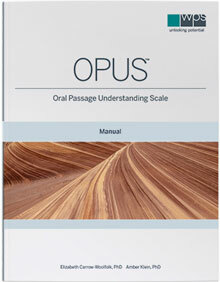 The OPUS can be used as a companion to the CASL-2 or on its own anytime you need to measure how well an individual understands orally presented information. It provides important evidence for everyone involved in treatment, so you can help children and young adults reach their potential at school, at home, and at work. The OPUS is individually administered. The examiner reads a passage and related questions aloud from a self-standing easel and the examinee responds orally–no reading or writing required. Administration time is approximately 10 to 20 minutes.